Anathema's live performance had always been something special and their latter day music is built for an arena such as the roman theatre of Philippopolis and the accompaniment of the Plovdiv Philharmonic Orchestra. Outdoors, under the stars and note perfect, Universal showcases the Liverpudlian bands' incredible atmosphere with a heavenly precision. Directed by Lasse Hoile, who has also made concert films for Porcupine Tree, Stephen Wilson and Opeth, Universal is a wonderful testament to the euphoric power that Anathema hold. Taking most tracks from the critically renowned work that was Weather Systems, Anathema take both spectators and after the fact viewers on a journey of emotional upheaval. Their brand of uplifting progressive rock is a world away from their early days as a death/doom band but their transformation has been delightful to behold. No one could have guessed this is where the band would end up but lo, here they are and they are absolutely on top of their game. Beginning with the gorgeous strains of “Untouchable Part 1,” Universal immediately sends chills travelling across your skin as the goosebumps rise to coincide with Vincent Cavanagh and Lee Douglas’ beautiful harmonies. Their voices play off each other with delicate touches and the melody of the song steadily grows and blooms into one of the most incredible pay offs in rock music of recent times. 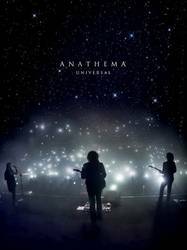 The affecting guitar tone only adds to the heightened emotion of the track and watching the DVD shows just how much this means to both the band and the crowd, the smiles that crack across faces and the shimmer in people’s eyes is testament to Anathema’s power as a live act. The Plovdiv Philharmonic Orchestra add touches of sophistication to the already momentous with soaring strings that lift the songs into new places of hope, joy, pain and sadness. “The Storm Before The Calm” sounds much more passionate live than it does on record and the progressive build into the second half of the song and Vincent Cavanagh’s flying vocal is worth the tense wait just to hear his voice take off before the band lead their audience into a magical “Everything” and a huge sounding “A Simple Mistake.” Such is the power of Anathema that they can make even the most heart-breaking songs sound completely stunning, particularly during favourites like “A Natural Disaster” or the genuinely moving “One Last Goodbye” and it’s in these moments that the strength of the bonds between the band members shine through. They’ve been through a lot as a group, as family (three Cavanagh brothers, the Douglas siblings) and it’s the small looks between them that give Anathema life and soul. “The Beginning and the End” sails on Danny Cavanagh’s incredible soaring guitar solos and Vincent’s voice often shimmers with an affecting emotion before “Closer” ushers in a short, catalogue based section of the show. Lee Douglas strikes out on “A Natural Disaster” and her wavering approach carves the song into a soul destroying narrative of loss and regret. “Deep” from 1999s phenomenal Judgement sweetly leads into “One Last Goodbye” which pulls at the heart and rips it to shreds. The audience are one hundred percent vocal about their appreciation and the looks on those people’s faces says more than words ever will. The lack of footage to link to show you just how spectacular this moment is is very disappointing so instead take a look at this live version from a show in London three years ago which ranks as the most incredible live band experience I have ever had the privilege of being witness to. It was breathtaking, moving and wholly devastating. “Fragile Dreams” from Alternative 4 (which marked the biggest musical turning point of the bands career) ends Universal on a bittersweet note as it all but fades out. But, the band come back for a glorious encore and play the song again in all its monumental glory to legitimately close the show which again showcases their superb ability to write rollicking rock songs and sad laments alike. Anathema are untouchable right now and Universal delivers everything both longtime fans and newcomers could want from the live experience. Posted March 18, 2014, 1:14 a.m.
Posted Aug. 18, 2013, 11:27 a.m.
Posted July 10, 2013, 8:40 p.m. Anathema and Alcest have announced a fall North American tour where the two bands will co-headline and Mamiffer will open. Check out the dates below.